(Stuttgart, June 2011/RDP) – Germany’s Federal President, H.E. Christian Wulff, joined representatives of the three German National Scout Associations for campfire talks when he recently attended the 14th German Youth Welfare Days in Stuttgart. Sitting in front of a panorama picture taken at the 2007 International Scout Camp held in the gardens of Schloss Bellevue, the President’s Official Residence in Berlin, the President discussed the German Associations’ key areas of activities. The President shared his viewpoints on international youth education, on sustainable development of children and young people, as well as on different areas of youth policy. “Young people not only need adequate space for volunteer engagement, but also our society’s recognition of this engagement”, the President said. He agreed that recent developments in Germany’s school and higher education systems might have an impact on the work of youth associations, such as the Scout Movement. 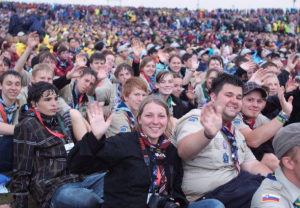 “If our society wants to see its young people be engaged in volunteer work, it needs to provide the appropriate and stable framework”, added Gunnar Czimczik, youth policy spokes person of Ring Deutscher Pfadfinderverbände (RDP), the German National Scout Organisation. The President noted with great interest the fact that Berlin was host city for the 21st European Scout Conference in August 2013 (as well as of concurrently held 14th European Guide and 14th European Guide and Scout Conferences). (Berlin, August 2011/VCP) – More than 150 young people have been invited to be present at a special ceremony in Berlin later this summer, when H.E. Christian Wulff, the German Federal President, for the first time ever, will honour 14 young people for their volunteer engagement in youth associations. Among those honoured are Saskia Scholten, DPSG, and Benjamin Euen (from VCP). DPSG and VCP are two of the three member associations of German’s National Scout Organisation, the Ring Deutscher Pfadfinderverbände (RDP). “It is far from obvious that young people continue to be engaged in volunteer work while facing growing requirements of school and higher education. Particularly encouraging is the fact that those who were engaged when young usually continue to do so throughout their adult life to the benefit of their community,” the President noted in a communiqué in which the recipients were introduced, adding that he felt it more than appropriate to recognise the young peoples’ volunteer work.